Ethel Fairmont Snyder Beebe was my great-great aunt. She was one of two matriarchs on my Father’s side of the family. When I was born, she was already almost 63 years old. Sadly, it took me a long time to realize and fully appreciate her accomplishments. She was a leading, early voice in the humane movement, forming the group that founded the Kansas City (MO) Humane Society. In 1921, she testified before the Senate Committee on Agriculture and Forestry on behalf of the National League to Preserve Food Animals regarding the prevention of the transporting and sale of stunted food animals. Later, she was appointed honorary vice president of the American Humane Education Society. 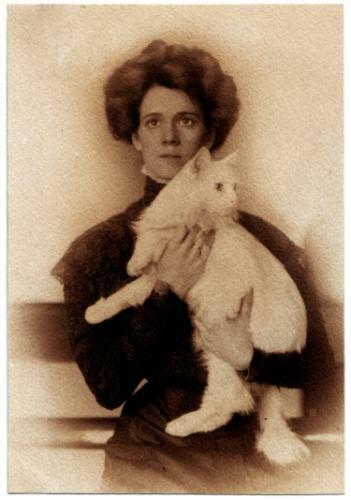 In 1916, in spite of the war in Europe and the unstable situation in the Far East, she traveled alone to Japan where she worked collaboratively with Mary Elkinton Nitobe to lay the groundwork for the Japan Humane Society and the Japanese Society for the Prevention of Cruelty to Animals. She authored two children’s books: Rhymes for Kindly Children, illustrated by Johnny Gruelle (author of Raggedy Ann, etc.) and The Lovely Garden, illustrated by John Rae, both first published by P. F. Volland. She wrote a range of plays, (some co-authored with Alice Gerstenberg) and, for several years, had a newspaper column entitled “The Listening Heart” which appeared in the Waterbury Republican. She wrote and published numerous poems and an analysis of miniature portraiture. Among her friends were a broad range of artists, authors, actors and political activists including Marjorie Kinnan Rawlings, Alice Gerstenberg, Esme Wynne-Tyson, Minnie Maddern Fiske, Alexandra and Ilya Tolstoy, Henry Stevens Salt, Tom P. Morgan, Clay Lancaster, Anna Hyatt Huntington, and Nancy Cox-McCormack. Though she herself is not someone who has been the focus of any of my scholarly initiatives, I include her on my web site to give her the recognition she deserves. NB: Like many women of her generation, Ethel Beebe (known to her friends as “Monty”) published most of her writings using a somewhat androgynous pen name, specifically Fairmont Snyder. Rhymes for Kindly Children, modern Mother Goose jingles. Illustrated by Johnny Gruelle. Chicago, New York [etc.] P. F. Volland & Co., 1916. The Lovely Garden. Illustrated by John Rae. Chicago : P. F. Volland Co., 1919. Strong, Frederick C. III and Nancy Strong Weyant. “Ethel Fairmont Snyder, Mary Elkinton Nitobe and the Founding of the Japan Humane Society.” The East , January/February, 1997. 13-16, 56. A Guide to the Ethel Fairmont Beebe Papers, University of Florida Smathers Libraries.